The Power BI service (SaaS) and the Power BI Embedded service in Azure (PaaS) have APIs for embedding your dashboards and reports. This feature means you have a set of capabilities and access to the latest Power BI features – such as dashboards, gateways, and app workspaces – when embedding your content. There are two main scenarios when embedding Power BI content. Embedding for users in your organization (who have licenses for Power BI) and embedding for your users and customers without them requiring to have Power BI licenses. The Power BI REST API allows for both scenarios. Embedding for your organization allows you to extend the Power BI service. Embedding for your organization requires that users of your application sign into the Power BI service when they want to view the content. Once someone in your organization signs in, they only have access to dashboards and reports that they own or that someone shared with them in the Power BI service. Examples of embedding for your organization include internal applications, such as SharePoint Online, Microsoft Teams integration (you must have Admin rights), and Microsoft Dynamics. You can go through the Embedding setup tool to embed for your organization to get started and download a sample application that walks you through integrating a report for your organization. Embedding for your customers lets you embed dashboards and reports for users who don't have an account for Power BI. Embedding for your customers is also known as Power BI Embedded. Power BI Embedded is a Microsoft Azure service that lets independent software vendors (ISVs) and developers quickly embed visuals, reports, and dashboards into an application through a capacity-based, hourly metered model. 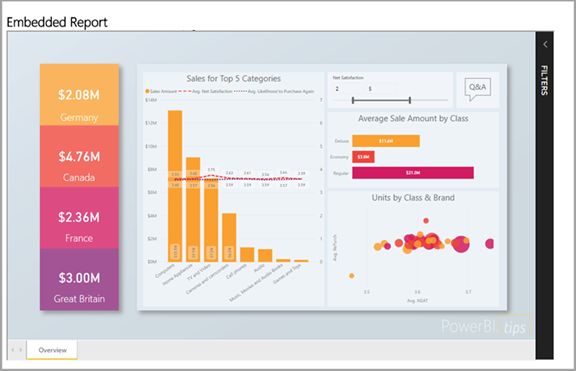 Power BI Embedded has benefits for an ISV, their developers, and customers. For example, an ISV can start creating visuals for free with Power BI Desktop. ISVs can achieve faster time to market by minimizing visual analytic development efforts and stand out among the competition with differentiated data experiences. ISVs also can opt to charge a premium for the additional value created with embedded analytics. With Power BI Embedded, your customers don't need to know anything about Power BI. You can use two different methods to create an embedded application. One option is to use a Power BI Pro account. Another option is to use service principal. 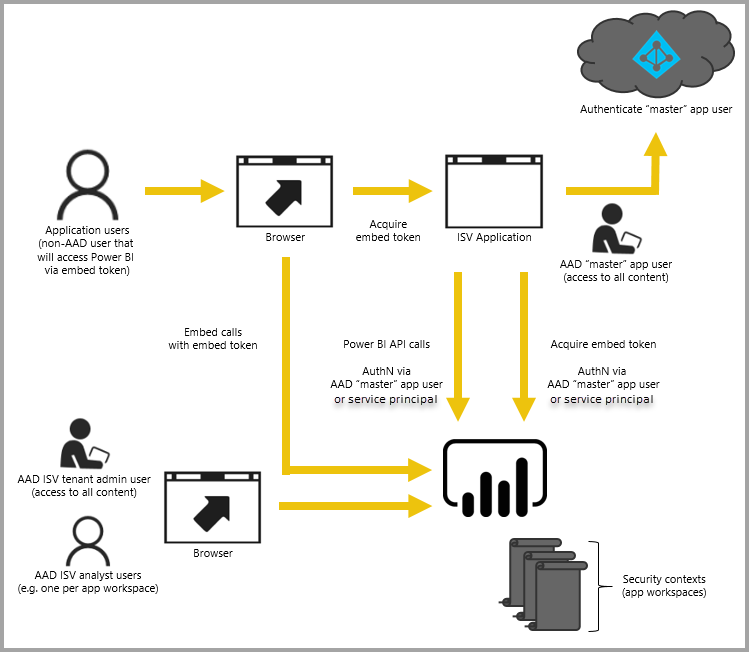 The Power BI Pro account acts as a master account for your application (think of this master account as a proxy account). The Power BI Pro account allows you to generate embed tokens that provide access to dashboards and reports within the Power BI service that are owned and managed by your application. Service principal can embed Power BI content into an application using an app-only token. Service principal allows you to generate embed tokens that provide access to dashboards and reports within the Power BI service that are owned and managed by your application. Developers using Power BI Embedded can spend time focused on building the core competency of their application rather than spending time developing visuals and analytics. Developers can rapidly meet customer report and dashboard demands and can embed easily with fully documented APIs and SDKs. By enabling easy-to-navigate data exploration in apps, ISVs allow customers to make quick, data-driven decisions in context from any device. While embedding has a dependency on the Power BI service, there is not a dependency on Power BI for your customers. They do not need to sign up for Power BI to view the embedded content in your application. When you're ready to move to production, your app workspace must be assigned to a dedicated capacity. Power BI Embedded in Microsoft Azure, offers dedicated capacities to use with your applications. For details on how to embed, see How to embed Power BI content. You can now try to embed Power BI content into an application, or try to embed Power BI content for your customers.